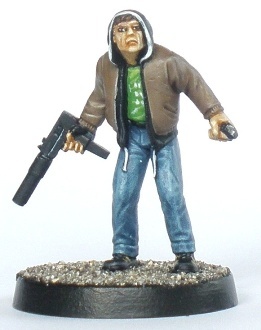 The inaugural Penultimate Vanity Project offering is modern era, zompocalypse survivor Paul. I decided to start this series with the model that most closely represents what I actually look like. All further PVP entries (no matter how esoteric) can therefore be measured against this one. The figure is Baker from Hasslefrees Adventurers range. I bought the figure specifically to paint up as a modern version of myself for gaming with. Despite all of my recent talk about using certain heads, cats, glasses and the like to create a recognisable “branding” of my self-portrait figures, I didn’t do anything like that this time. I considered adding glasses to the model but didn’t for two reasons: the hood made it awkward and the miniature is so beautifully sculpted (as one would expect from Hasslefree) that I didn’t want to cover up the detail with some crude conversion work. The miniature is sculpted wearing boots rather than trainers. I don’t tend to wear boots very often so I decided to paint them up like a pair of my trainers anyway. For the delectation of all of you fashionistas out there the trainers and the t-shirt are shown below. I got a bit lazier than usual when highlighting the jacket, as is quite visible in the shot below. As the viewers eye tends to be drawn to the face and bright green shirt I don’t think that it matters that much really. Why am I only wearing one glove? Although the real me is unlikely to behave in a terribly pro-active fashion in the event of the cannibalistic dead walking the Earth, I figured that some artistic licence was required to make a gaming piece that would be fun to use. Although obtaining a muzzle suppressed machine pistol in rural Ireland is difficult at the best of times, I nonetheless decided to unrealistically arm the miniature with the supplied ranged weapon rather than the crowbar (also supplied) as it would be more fun to game with. Miniature realism is a consideration, but I am not going to let it get in the way of my fun. For the record, I don’t own a set of knuckledusters either. I like the way that the face came out. It looks close enough to my face to be acceptable, although as discussed in my project introduction post, getting a 28mm replica of any specific persons face is a tall order. The painting on the face came out quite crisp and the eyes didn’t end up too crossed, which is always a bonus. When fully dressed I look like a hundred dollars. Not quite “Derelicte“, but far from haute couture. A dedicated follower of fashion? Not so much. The photo is grainy. I really must up my miniature photo taking game one of these days. Putting photos of my clothes up on my gaming miniatures blog is absurd, but strangely amusing to me. I may do it with some other PVP entries as appropriate. Depending on feedback of course. 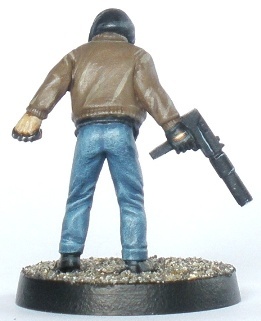 By painting a somewhat recognisable wardrobe on a 28mm figure it is possible to get recognition factor. When I showed this figure to gaming colleagues they “got” it. I don’t think that if they had seen the figure on the table that they would have immediately known that it was supposed to be me, but when given the figure and asked “This is supposed to be a model of me. What do you think?” they reacted positively. This is encouraging for future, more ludicrous Penultimate Vanity Projects in waiting. As some of the themes used for these figures are repeated I hope that a visual shorthand will develop that will make the PVP miniatures more recognisable to the observer. I have started another ongoing miniatures project that spans most of my other miniatures projects. Due to some real life stuff I wont be updating this blog this week. The next post will be on Sunday October 10th.